Folks, it’s that time which you have all been anticipating! Slackware 14 has been released today, wrapping up 17 long months of development. Read the announcement to learn all about this new release.The Slackware homepage has some more information for you, as well. I think there has not been such a long series of release candidates, ever before. Thanks to the co-operation of our Slackware user base, there has been a tremendous amount of beta testing during the past few months. Pat could probably have gone on releasing updates and allow further testing for months to come, but essentially, we have a solid and stable Slackware release in our hands. We have X11R7.7 (X.Org server 1.12.3), KDE 4.8.5, XFCE 4.10, the Linux 3.2.29 kernel as default, but with lots of sample kernel configs for newer 3.x kernels included as well. NetworkManager has been added for people who like to be mobile and configure their network connections using a GUI. We still include WICD, and we kept full support for the traditional style of network configuration. There is lots more! Of the nearly 1150 packages in Slackware core, more than 800 have been upgraded or recompiled since Slackware 13.37. “Why were not all of those packages recompiled or upgraded” I hear you say. Remember, the Slackware adagium is “if it ain’t broken, don’t fix it!“. Use the weekend to download the ISO images – our torrent tracker is ready and we have initial seeds on big pipes: http://www.slackware.com/getslack/torrents.php. And consider buying a subscription at the Slackware Store – it will help keeping the lights on at Pat’s place. Mind you – Pat is the only one in the core team who is financially dependent on the sales of Slackware DVD’s and other merchandise. The rest of the team does this for fun, not for profit – we buy our own subscriptions from the Store, just like you do. Posted: 28 September, 2012 in Slackware. great! so many days before the end of the world! I expect I’ll be seeing a credit card charge shortly then, since I’m a longtime subscriber who not just supports Patrick’s efforts, but likes to collect the new releases in shrinkwrap – so to speak! Well, not a lot to say other than that, I’ve been happy running -current on most machines for many years now, but I encourage everyone to head to the store and pick up the latest release (They may be worth much more some day!). Thanks a lot to the Slack Team and all testers! Hi Eric. Where did you get the slackware 14 image in the post from? I like it. Nice. I’m definitely getting one! and next week I’ll buy the dual dvd disc. Hi and Congrats! Great work As usual :D! Thank your excellent job on the new release. 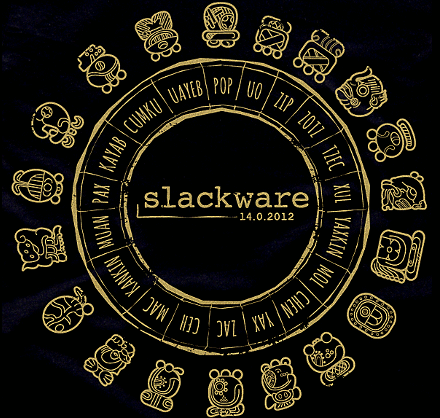 hey, ordered the Slakware-14 tee… its just mind blowing…. But, what it really mean? Front and awesome back side? Thank you Patrick, Eric Hameleers, Robby Workman and everyone who contributed. God bless you all! I’m on -current, so I’ve been living the sweet Slackware 14 life for a while now, and it is great. Thanks to the entire Slackware team for making their magic. Now I’m just waiting for my Slackware 14 DVD. Nice work! Hope to see something as good as Slack 8.1 was. Congratulations to Pat and team! Thanks to everyone who participates in this great OS. You are right, slackpkg should be upgraded first! I have updated the article. Slackpkg should be able to handle a glibc upgrade without issues. Time for a donation again – with shipping costs, a subscription makes no sense from abroad, so I donate once or twice a year as am able 🙂 In the end I think I’ve paid more for Slackware than windows, and why not? Shouldn’t you *also* upgrade pkgtools along with glibc-solibs and slackpkg? No, that is not needed. If findutils, glibc-solibs, readline, pkgtools or sed are present in the list of upgradeable packages, then those are upgraded _before_ continuing with the rest of the list . You see “glibc-solibs” mentioned there… but that package needs some special considerations – see the SlackDocs article at http://docs.slackware.com/howtos:slackware_admin:systemupgrade – which makes it mandatory to upgrade glibc-solibs before running “slackpkg install-new”. I like the ever-growing stack of shrink-wrapped Slackware CD and DVD sets next to my desk 🙂 It is a long time ago since I even used a DVD or CD to boot the Slackware installer. I use PXE boot at home and have a bootable USB Slackware installer in my pocket. As long as the dollar-to-euro conversion rate is in my favour (being european) I will continue my subscription. Although the donation option could appeal to a lot more people since it allows you to choose the amount of money you can afford.